It seems that the Pangu jailbreak solution has motivated the release of several impressive new jailbreak tweaks, with one of the most recent being Aslock. This smart package, which jailbreakers can download for $0.99 on the Cydia Store, adds a couple of useful new gestures to the iOS Spotlight interface. The first gesture allows users to easily lock their iOS device by swiping down – and holding down – on their iPhone’s screen. The second gesture, on the other hand, lets users activate the multitasking interface by swiping down and then back up on their iPhone’s screen. In both cases, Aslock allows jailbreakers to more easily activate elements on Apple’s iOS which would usually require the press of a physical button. You can configure options for both gestures in the Settings app, and here Aslock adds a dedicated preferences pane. Options such as “Trigger Immediately” and “Trigger Length” can be altered and adjusted, and the jailbreak tweak can also be enabled or disabled outright. The only downside to the package is that it naturally interferes with Spotlight itself. However, if you don’t often use the iOS search feature, this shouldn’t be a problem. As a reminder, Apple launched a Lock button replacement program for select iPhone 5 handsets back in April. If you own a qualifying model that suffers from a faulty Lock button, Cupertino will repair the handset free of charge. For folks who have a general dislike for the iPhone’s Lock and Home buttons, however, Aslock can help. 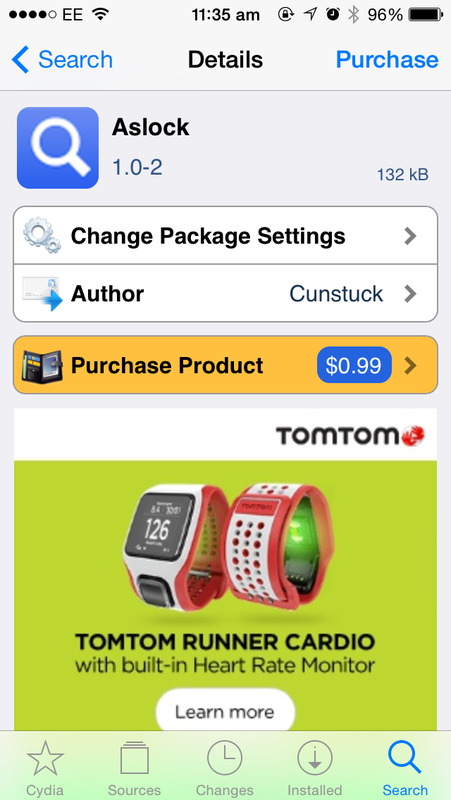 As mentioned, the package is available to download on the Cydia Store for $0.99. See also: Living Planet Goes 2.0 With New Features For Creating ‘Tiny Planet’ Videos, Cydia Tweak: Jazz Up The Volume HUD With ColorfulVolume For iOS 7.1.x, and Turn Simple Sketches Into Tappable Prototypes With The Newly Updated Marvel App.